Despite the name, Air New Orleans operated most of their flights in the Sunshine State during the 1980s. 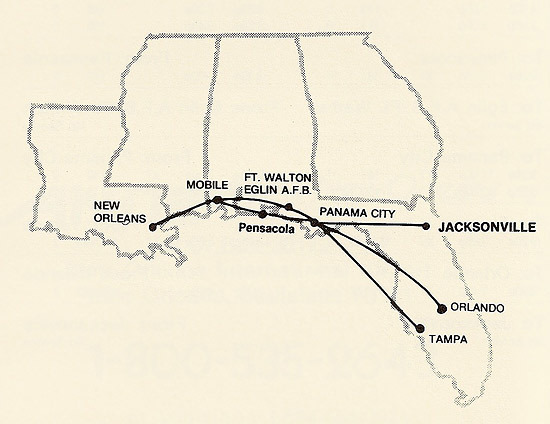 The company began flying on August 10, 1981 with routes between New Orleans, Mobile and Pensacola. using Piper Navajo equipment. By 1984, they had expanded eastward to Eglin Air Force Base / Ft. Walton Beach, Panama City, Jacksonville, Tampa, and Orlando and had added Beech 99s and Piper T-1020s. Below: Beechcraft C99 N7209W circa 1987. Air New Orleans route map from September 1984. 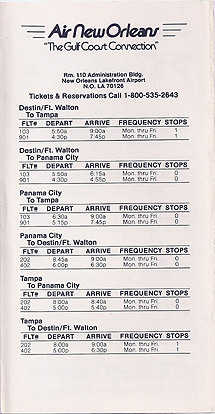 Air New Orleans timetable dated August 15, 1985 showing their extensive Gulf coast route system. Courtesy of the indispensable Arthur Na. 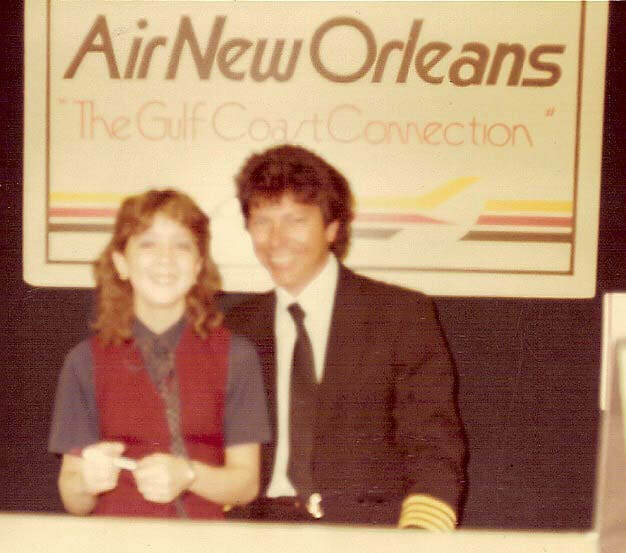 The following five photos were sent in by Sandy S. and were all taken at New Orleans, "1985-ish". An Air New Orleans crew poses with one of the airline's Beech C99s. It's hard to read, but it looks like it says "Spirit of Panama City" beneath the cockpit window. Employees posing with a Piper PA-31 Navajo. Air New Orleans Beechcraft C99 N7209W, "The Spirit of Fort Walton / Destin", is pictured on the ramp in New Orleans. A mid 1980s view of the Air New Orleans ticket counter at their home base. Judging by the wall, this must have been formerly occupied by Eastern. An unidentified Captain and ticket agent smile for the camera. Air New Orleans operated a trio of Piper T-1020s in the mid 1980s. 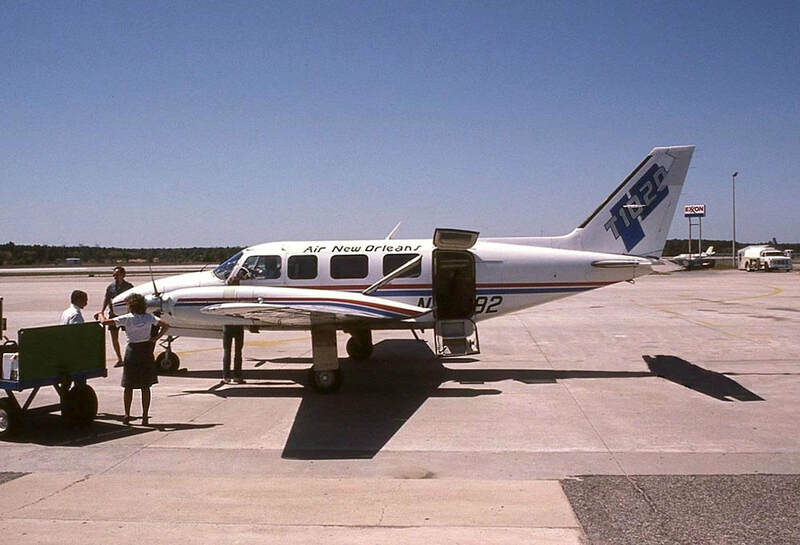 The T-1020 was a variant of the Piper PA-31 Navajo designed specifically for the commuter airline market. It had extra seating, less baggage space and reduced fuel capacity compared to the standard PA-31. Continental Airlines contracted Air New Orleans in 1986 to provide Continental Express code-share flights. Despite the increased traffic from the agreement, ANO suffered continued losses and filed for bankruptcy protection in January 1988, although flights continued. When Continental terminated the code-share agreement a few months later, it effectively brought an end to Air New Orleans. Here's a collection of Air New Orleans timetables. Many thanks to Arthur Na (denoted with an asterisk) for providing most of these. For additional timetable images and information, visit the Air New Orleans page at Timetable Images.